A very fine interpretation of the classic single-coil guitar with an old-style, clear and ringing sound and a feel to die for. Design and build. Enhanced but classic tonality. Neck feel and playability. Might be too far looks-wise from Fender's finest for some. Knaggs now gets to "sign his own paintings". The geometry of the body closely follows the Stratocaster. A set neck, and just check out that lovely heel. The Severn reflects long-time PRS employee and founder of Knaggs Guitars Joe Knaggs' passion for his 1961 Fender Stratocaster, his go-to guitar for many years. It's no surprise, then, that we have a correct 648mm (25.5-inch) 'Fender' scale length, while the geometry of the body closely follows the Stratocaster interms of the layout and positioning of the strap buttons in relation to the fret positions. The inside curve of the upper horn closely follows a Strat, but the waist is less pinched and broader; on the treble side, the waist sits a little lower down and does create a different feel, albeit subtle compared to a Strat when played seated; it's broader across the lower bouts by about 18mm, with a slightly squarer base. The body's 45.5mm thickness is certainly Fender-like but the almost SG-style chamfering to the top's edges creates a different look, notably in the forearm contour (and the rib-cut on the rear), but also to the horns. If you know your PRS guitars, you'll see similarities between this and the Mira - primarily a Joe Knaggs design, of course. A one-piece rock maple neck is glued into the body with a distinctive, comfortable heel shaped like the bows of a boat. The treble cutaway sits deeper into the body than on a Strat and access to the higher fret positions is easier. Shape-wise the '61 profile feels old-Fender-like and is nicely curved and 'C'-shaped in the lower positions, becoming a little V'd as the depth - 21.8mm at the first fret, 23.9 at the 12th - and width increases up the neck. "I've played a '61 Stratocaster all my life, so it's based around that neck shape but a little bit different," says Knaggs. "It has similar width and front-to-back specs, but it's our own spin on it. It's not quite the same." The fingerboard is cocobola, a purple-tinged brown with almost orange streaks, much like Brazilian rosewood. It features a 216mm (8.5-inch) radius, which is slightly flatter than the Fender original (184mm/7.25-inches). With nicely-rounded fingerboard edges and tall, thin wire (like Dunlop 6105 but slightly taller), the feel is very positive - there's no upper-fret choking and enough string height to the set-up to dig in. Topped with a Fender-inspired headstock that's a little more ornate than the original, we have a star and Knaggs logo transfer and it's back angled, like a Gibson or PRS, so there's no need for any string trees. Set-up, courtesy of another PRS alumni John Ingram, is spot on: the friction-reducing nut cut and smoothed perfectly, allowing the strings to flow in a straight line to the six-in-a-line Gotoh locking tuners. But it's at the other end of the strings where the crucial part of the Knaggs design lies. This all-steel vibrato uses a hinged pivot between the moving, walled (and a little PRS-like) vibrato and the almost Tele-like anchor that also holds the bridge pickup. It's super smooth in use, with sensible pitch range and a little up bend. The moving vibrato is slightly recessed into the body so the six block saddles can be raised without seeming too tall, burying the adjustment screws inside the saddles, making palm muting comfortable. Aside from the bridge pickup, the other two - all Seymour Duncan SSL-1 single-coils with the middle one reverse wound with reverse polarity - and controls for volume, neck and middle tone and bridge pickup tone, are mounted on the wenge scratchplate. The jack output is on the guitar's side and our favourite Dunlop Strap Lok buttons are standard. There are no electronic tricks save for fairly common 'mods' such as the tone control functions and hum-cancelling in the mixed pickup positions. Referencing with a variety of three single-coil guitars, a few things become apparent, the first being that the ring of the Severn is really special. It's not at the expense of that explosive twang and fairly quick decay, but it rings on almost as if you have a cleverly set compressor that's squeezing out every last ounce of sustain without touching the front end of the note or chord. There's plenty of attack too. The note barely compresses, as it does with some lighter-bodied Strats, but like a classic Fender we get an almost brutal hammer-on-metal tone picking hard by the bridge on the bridge pickup. The neck pickup, too, retains plenty of that character and certainly isn't as soft sounding as some of our reference guitars. But those highs aren't ear-wearing, though they will cut through. This clarity really benefits the mixed pickup positions, although that character suggests an older, rawer tonality - more Stevie Ray than Knopfler. It sounds as if the Severn was produced by T-Bone Burnett or Buddy Miller - rootsy, timeless and somehow larger than life. The Knaggs Severn is right up there with any of the top-quality electrics being built today - and that certainly includes those from Nashville and Stevensville. Initially, it seemed ultra expensive, but this Tier 3 models, which will no doubt hit the streets for less than the full retail prices, is certainly in the right ballpark. In fact, for such quality and small-scale production some might think it's too cheap. 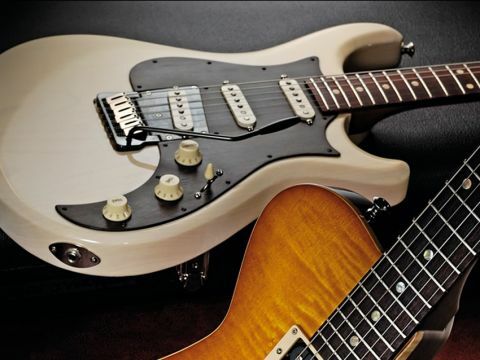 But why would you chose one over the numerous available Custom Shop Strats, or those inspired by these classics? Well, while it displays its roots - but with more than enough visual differentiation - it doesn't mess with the feel of the originals' scale length or geometry and improves on those classics in numerous ways. The resonance is the icing on the cake though - the enhanced ring and sustain keeps you going back for more. It's a truly great guitar.